← Power to the Beeps? 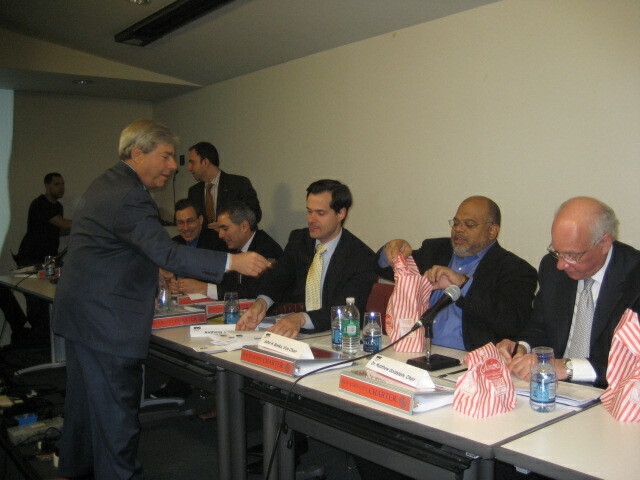 First came the cheesecake: Brooklyn BP Marty Markowitz greeted the 2010 NYC Charter Revision Commission members at their first public meeting, at the NYC College of Technology in downtown Brooklyn, and gifted each one with Junior’s cheesecake. Then commission chair Matthew Goldstein explained the purpose of the meeting to an audience of about 75, and invited his colleagues to introduce themselves. When the intros progressed across the crowded stage to commission member Carlo Scissura, Scissura leaned back and deferred to colleague Hope Cohen, who had been forced to sit behind him when the dais got too crowded for all 15 commission members. Goldstein, a mathematician by training, joked about this as being an example of “a packing problem.” It was not his last mathematical allusion. Our take: The commission’s March 3rd appointment date didn’t leave enough time to hire the staff members who could prepare for a public meeting scheduled only two weeks later. Goldstein impressed us as a strong leader, stepping through his agenda with ease. After introductions, he took pains to pay “tribute” to commission colleague Anthony Crowell, a senior Bloomberg counsel, an acknowledged charter expert, and a veteran of five previous charter revision commissions. Chairman Goldstein announced that the commission will try hard to place proposals on the 2010 ballot, a sentiment echoed after the meeting by commission member Stephen Fiala. To achieve this, Goldstein said, the commission will have to adhere to a “very aggressive” schedule, formulating its final proposals by the end of August and filing them with the Board of Elections by September 3. In the audience, leaders of the city’s Independence Party sat quietly and considered the testimony they will deliver when the commission conducts public hearings in April. One of them, NY County Chair Cathy L. Stewart, told us that her party’s goal will be to convince the charter commission to recommend non-partisan City elections: not an unlikely target with a commission appointed by Michael R. Bloomberg, whose 2003 appointees did the same thing, but were rejected by voters. 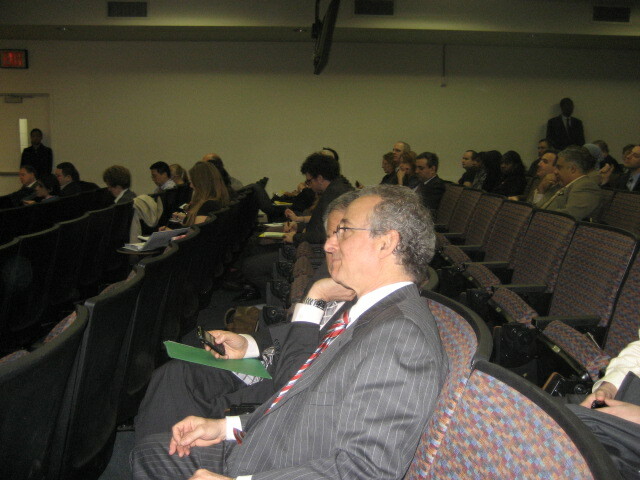 Also in the audience: CUNY General Counsel Rick Schaffer, whom CUNY Chancellor Goldstein said would be serving (pro bono) as General Counsel to the 2010 Charter Revision Commission. Schaffer’s designation raises an interesting question: How will he interact with commission member Anthony Crowell, himself a lawyer and charter expert. As we commented before, we expect Crowell to play a key role in making sure that the commission’s agenda doesn’t deviate too far from the mayor’s. This entry was posted in 2010 NYC Charter Revision and tagged 2010 charter revision, 2010 NY charter, Anthony Crowell, bloomberg charter, charter revision, Marty Markowitz, Matthew Goldstein, Mayor Bloomberg, Michael Bloomberg, Michael R. Bloomberg, New York City Charter, New York City government, non-partisan elections, NY charter commission, NY charter revision, NYC charter, NYC Government, NYC Independence Party, Rick Schaffer. Bookmark the permalink.